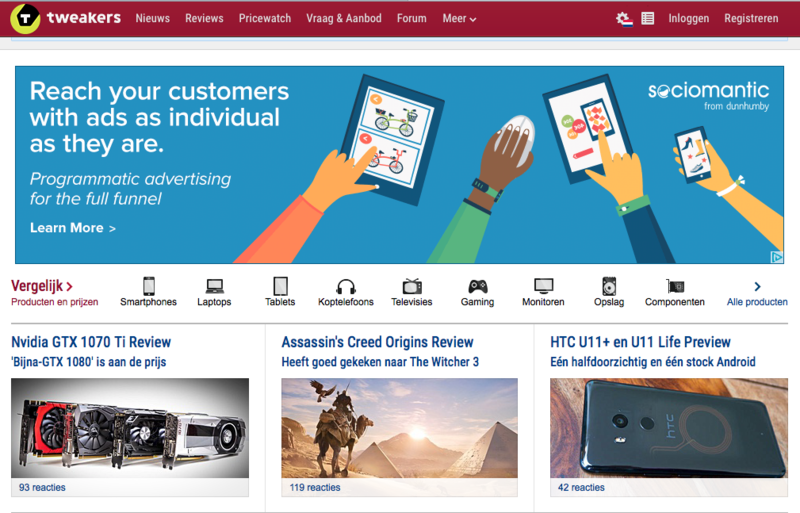 Tweakers is the largest electronics and technology website in the Netherlands, containing reviews and price comparison. If you would like to advertise on Tweakers, you can contact advertisement@tweakers.net or +31 (20) 204 2525. Product description Short description containing key information about the product. Product title Full name or title of the product. Product price Current price of the product. Numbers and decimal point, no currency symbols. Product category Category for the product, e.g. laptops. Product URL Link to the product image on the website. Product review Review comments for the product. Review author Name or title of the reviewer of the product. Payment options How the product can be paid for, e.g cash, Visa, Mastercard., etc. Shipping method What the delivery options are for the product. Delivery time How long it takes to get the item delivered. Specifications Any additional specifications about the product you would like to add. What formats does Tweakers accept? Files should be provided to Tweaker in XML format. Files should be placed in an accessible URL location. Need help in optimizing your feed and getting it to Tweakers? We can help, feel free to contact us below. Need Help With Tweakers Feed Management?